In response to your question regarding the Ballantine/Pan Adult Fantasy Library. I have copies of Evangeline Walton’s ‘The Island of the Mighty,’ both Pan & Ballantine, the text block is the same. The differences are: title page of the Pan edition shows Pan/Ballantine with Pan’s London address. The copyright page is all British including printed by Richard Clay. The dedication has been reset. 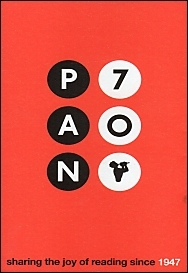 The cover for Pan has Pan logo on spine, & where the US copy sports Ballantine Books followed by ISBN it is blocked over by Pan/Ballantine. The Canadian edition shows printed in Canada on the copyright page but is otherwise the same as the US printing.